Today, Microsoft decided to become overwhelmingly generous towards College Students by offering a full upgrade to Windows 7 Home Premium for just $30. The upgrade will cost $120 in retail stores when it goes on sale next month. To be eligible you must have a ‘.edu’ email address provided by your University and enrolled as a full-time student. This isn’t the first time Microsoft has offered such a great discount. Back in 2007, they began to offer Microsoft Office 2007 Ultimate, which would normally cost a few hundred bucks, for just $60 through a program called ‘The Ultimate Steal’. That program is also still running, which interestingly means that the OS will cost half of what Office will for students. Microsoft most likely is offering this deal to get as many customers switched over to Windows 7 as possible, especially after the widely dreaded Windows Vista. In addition, with Apple selling its latest iteration, Snow Leopard, for just $30, this is a great idea. If you don’t know if your machine supports Windows 7, try running Upgrade Advisor, which will check your system configuration and hopefully give you some good news. To get your copy for $30, just click on the links below! And that’s not all, if your field of study is any type of technical or engineering majors, you’re eligible for an even better deal. If you sign up with IEEE for a $30 membership, which will last for the rest of the year, you will have access to tons of Microsoft software including Windows 7 Professional x64. (That’s the full edition! Not upgrade version from the deal above.) Signing up as a student using your school’s ‘.edu’ email address and selecting your school from the selector. After about a week, you’ll get an email from MSDNAA giving you a username and password to access and download Windows 7. Both deals are independent of each other. I’ve personally tried the 2nd option, the IEEE discount, as a student at UC Davis and it worked perfectly. I’ve also purchased Office 2007 through the Ultimate Steal and it worked perfectly. I haven’t had a reason to try the Win741 deal since I already am running Windows 7, but Microsoft officially tweeted about it, so it should be completely safe. So at this time, there is no information as to whether it will be put back up anytime soon. 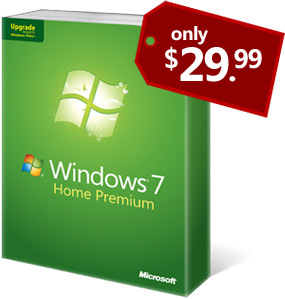 For now you folks will have to stick to getting Windows 7 home Premium through the Win711 offer. nice info, i’d like to buy..
That is great to know. I’ll pass the info along, to all the Students,I know, so they can pass it onward. (Having an OEM business that has a partnership with Microsoft) and the same with each of the versions [They were all discounted significantly]. I know there will be many of family & friends, plus clients, who will be grateful, I thought to put all those funds out, in advance, so they won’t have to pay four times more, for their Windows 7 when they come in for an upgrade, or repair, to their PC, and decide they want Windows 7…I wish they had done the same for XP!